Contents and Media: A4 portrait format and on very high quality glossy paper, it has 50 pages per edition. 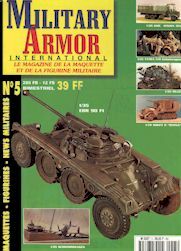 The magazine under review is Military Armor International, published by MA Editions, 9 Quai Ulysses Besnard, 41000 BLOIS, France. Price 39 Francs and published 6 times a year. Review copy kindly supplied by the Editor. Published in French and now with an English supplement. Printed in A4 portrait format and on very high quality glossy paper, it has 50 pages per edition. Split into the usual sections of articles and adverts. A nice touch is the inclusion of the model maker's photo with each article. The articles are well written and contain extra information about the kit with photomontages of the real vehicle or drawings. The quality of the colour photographs is superb and the layout is very good. The choice of articles covered is refreshing and it seems to go out of its way to publish unusual items not covered by other well-known magazines. So just what do you get for your money? A magazine that is in the top two in the world and catching up on its main rival Steel Masters very fast. It covers unusual subjects in an informative way without talking down to the model maker. The adverts is a great section for it showing all those models, which are available but never seem to make it to your local shop. You can mail order direct via the Internet or fax in most cases now you know where to obtain them. Now it has an English supplement it is going to appeal to a greater audience and it should now go from strength to strength. I have only the following slight criticism about the photomontages of real vehicles - the photographs could do with being a little larger with text on the next page. I would also like to have seen drawings or plans included in the scratch building of the GMC AFKWX (in edition 5) and also the model photographed unpainted. I stress these preferences are purely personnel. I recommend it very highly, and I feel that it may put at least 3 English model-making magazines under threat! Pages 2-9: A Stug MK111 Ausf F/8 an in depth article of how to combine two kits to produce a different mark. Using the kits from Revell and Tamiya in 1/35 scale the author has produced a very good representation of the real article. Page 4 shows in clear photographs the parts from each kit combined and the areas of scratch built sections. As a bonus it has a photomontage of the original taken at Brussels Army Museum. A small photomontage of the Trucks and Tracks show earlier in the year. Pages 16- 21:An other GMC in 1/35 using the Italeri kit and combining scratch built parts. The author has constructed an excellent model of the Inflatable pontoon carrier. This one has the plans for the scaffolding erected on the GMC, but strangely has no plans for the pontoon section; a great pity. Pages 30-34: An Opel Blitz Maultier and Plus Model resin shelter are combined into this very good model. The author has represented the model in a very realistic way and has captured the feel of a vehicle, which has had a hard life. Pages 36-43 A diorama to rival any that the Dragon Wagon kit could produce. This uses the following resin kits in 1/35 scale of the Hemitt from Nimix and the Patriot also from Nimix with Verlinden figures. This is one diorama that I would love to see at Trucks and Tracks next year it is quite simply superb. The detail has to bee seen to be believed and the painting of the American chocolate chip uniforms is outstanding. Pages 44-48: Lastly a 1/15 scale model of the Pak 40 by Pro Models and figures by Verlinden, this again is an outstanding diorama both in terms of kit build and figure painting. The missing page numbers are in the main the adverts sections or new kit round up, for all those kits that never appear in your local hobby store and you didn't know where to obtain them. Now you do! EBR Panhard model 90 F1 in 1/35 scale, Schwimmwagan 1/35 scale, Paris 99 round up, GMCAFKWX 353 1/35, Tatra 1/35 scale resin kit, The Black sheep 200 mm Bust, Diana 1/72 by Milicast, Fort Varsmseet Museum Oslo, Good Morning Vietnam 1/35. 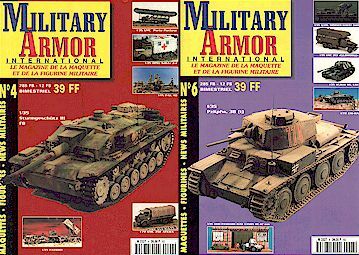 Pages 2-9: Has an interesting article on how to alter the 38(T) tank using the following kits Italeri and Dragon and some scratch building of parts. The model depicted is an early one used in 1940 by 7th Panzer Division in France. The photomontage of how the parts come together is very usefull and shows fully the parts from each parent kit. It also has half page of colour illustrations of the various turret markings and numbers used by some of the division at that time. Overall a very well thought out article. Pages 10-15: This article is all about the Panhard AMD 178 and Citroen both in 1/35 scale resin kits and produced by Alby. Once again with the use of preserved vehicles in photomontage form it helps to clarify minor details that you would otherwise miss. It also has two wartime photographs. I have very little information on both of these models so that every little helps. Page 17-22: Now this one is a particular favourite of mine the GMC Red Cross clubmobile body. Using the Italeri kit and completely scratch building the body inside and out the author has provided us with full plans for this much-neglected subject. A very highly detailed model and the interior is full and I mean crammed with the tiniest details. This is one model I would like to see in the flesh so to speak. Pages 30-36: Karl Morser resin kit in 1/35 scale by CMK, this is a truly awesome model and the author has produced an outstanding model. Original wartime photographs back it up. Once more the author has photographed it in the construction stage and is to be congratulated. Pages 40-42: Airfix 1/72 scale Chi-ha Type 97 tank, this simple diorama is let down by the painting of the figures. They are too heavily shaded for 1/72 scale and spoil what would otherwise be a very good diorama. One original war time photograph accompanies this article. Pages 44-48: A On Track Model 1/35 in resin of the Storer Emil. The article has one wartime photograph and is lacking construction photographs as with the other articles otherwise it is a very good model. The rest is made up of adverts and new kits released and a round up of the Italian Model show held over the period of 18-25 Aril 99 at Arzignano. Lastly I award an extra 10 points for the English supplement. Go out and order it today. You will not be disappointed.